Updated: Mea culpa. Folks point out an error in the figures I was using—Big Bang did indeed start off strong and get stronger. This is still, of course, a longer story, but USA Network's first week of ratings for Modern Family do not, in fact, outdo Big Bang during the same period. 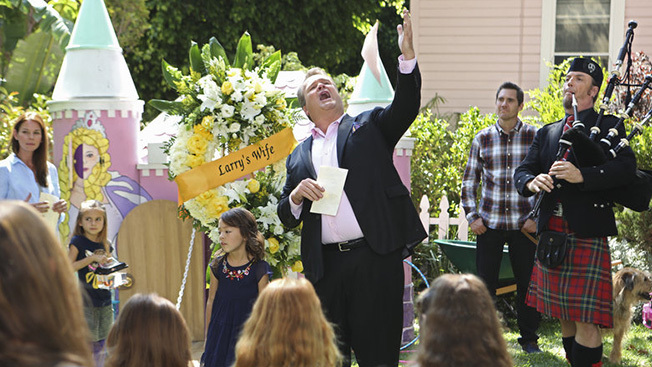 Buyers have been complaining for weeks now about the possibility that Modern Family on USA Network would not live up to its super-high off-net syndication price ($1.4 million per episode) or the hard bargain driven by the network during the 2013-14 upfront. Now that the hit ABC sitcom been on USA for a week, the naysaying has gotten, if anything, louder. Okay, so if you want to run the numbers against TBS’ ratings for The Big Bang Theory, which is now the gold standard for off-net comedy replays, you’ll see that during the same week, the roughly 1 million viewers a night Modern Family has brought in pale by comparison to Big Bang, which averaged a stout 2.59 million over—sit down for this one—43 airings last week. There are only enough hours in prime time to air the show 44 times (and no, not all those airings were in prime. A bunch of them were, though). As we’ve written before, Big Bang is a monster, and it’s paying for itself in ad dollars (originally negotiated by Linda Yaccarino, who made the jump from Turner to USA last year) and in anchor potential for TBS’ original series. But it's not fair to compare to the current week of the run, so let's take a look at Big Bang during week one of its run on TBS in 2011—and yes, the show did start off huge. In its first week on cable, Big Bang averaged 1.5 million total viewers across its airings; for its week, Modern Family nabbed an average 947,000 viewers across 18 telecasts. The question remaining is whether it will see the same build that Big Bang saw during its initial months—but that's a question for December, not next week. “It's a marathon, not a sprint,” said one TV exec. “This is a 90-day story.” The 90-day version, too, will help to answer whether or not it's still possible to make cable reruns of broadcast sitcoms a viable anchor programming strategy in the future. Is this a good overall idea, or did TBS manage to catch lightning in a bottle in 2011?